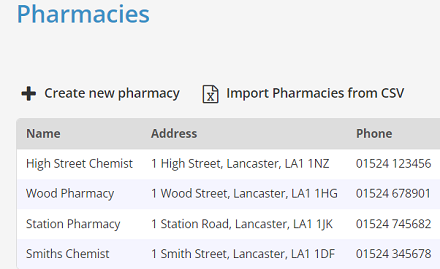 As pharmacists ourselves, we understand how difficult it is to keep all your paperwork in order—so we decided to simplify it and make it electronic. 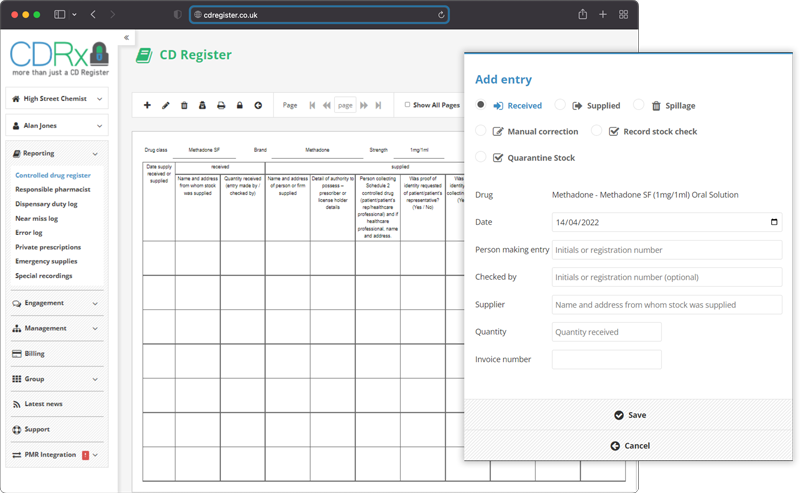 CDRx lets you manage your Controlled Drug Registers easily: it includes time-saving features like search and auto-complete, and makes sure that entries are made in a consistent format with all required details. 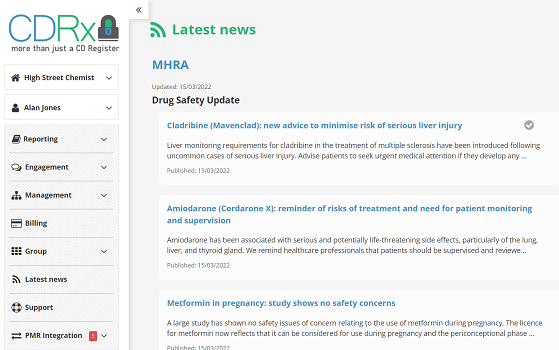 We created one website, with all CD registers, Near Miss Logs, Error Logs, Responsible Pharmacist Logs, Patient Feedback (via a tablet) and even an Advertising Module for displaying information and promotions to your customers. 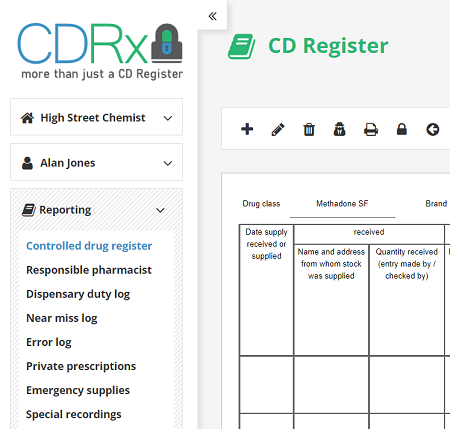 CDRx also has support for multiple pharmacies, each with individual pharmacy user accounts and a group-wide admin account. Get started with our free 28 day trial today, and see how much easier your record keeping becomes. Get in touch! Call our friendly support team on 0800 027 0671 or drop us a line at . CRDx is a product of MethaMeasure Ltd. © 2015. All rights reserved. All prices subject to VAT at the prevailing rate at time of purchase. information that you provide to us for the purpose of registering with our website or subscribing to our website services, email notifications and/or newsletters (which may include your name, address, email address, date of birth and gender. information relating to any transactions carried out between you and us on or in relation to this website, including information relating to any purchases you make of goods (which may include your name, address and certain card details). send to you our newsletter and other marketing communications relating to our business or the businesses of carefully-selected third parties which we think may be of interest to you by post or, where you have specifically agreed to this, by email or similar technology (you can inform us at any time if you no longer require marketing communications. All our website financial transactions are handled by our payment services provider. We will share information with our payment services provider only to the extent necessary for the purposes of processing payments you make via our website, and dealing with issues relating to such payments. We will store all the personal information you provide on our secure (password- and firewall- protected) servers. All financial data you send to or receive from us will be encrypted using SSL technology.